Planetshakers is more than a band name, it's more than just a ministry and it's far from an isolated experience. Planetshakers is a foundation shaking movement that's sweeping Australia off its feet and it's about to burst the bubble of American culture. The concept is simple: combine cutting edge speakers with topical relevance and worship woven music that reflects cultural relevance under the context of a super charged conference. Consider it comparable to the Hillsongs movement, but with an explosive, youth-oriented twist. "There's something powerful that happens when you mesh a spoken word message with the energy and explosion of live music," says Planetshakers' founder and director Russell Evans in his thick accent and contagiously pleasant tone. "This generation is looking for energetic, raw passion and they're attracted to anything they can perceive as real. Seeing the enthusiastic blend is attractive to people. That passion on stage, no matter if it's speaking or singing, makes them hungry." Planetshakers have been satisfying the appetites of the once spiritually bankrupt since 1997 when its first weekend conference was staged in front of 300 students at Paradise Community Church in Adelaide, South Australia. In the years that followed, the event ballooned at rapid rates, reaching 4,000 attendees by January 2000. Come this winter, Planetshakers pulled in 20,000 faithful in three major Australian cities: Adelaide, Brisbane and Perth. "Other than God's hand being over the ministers, I think the reason for the growth is because Planetshakers understands young people's needs and are able to bring it beyond just a worship experience," contends Evans after a moment of reflection on its evolution. "The goal is for people to have an encounter with God and the objective from there on out is to build local churches and ministries that young people can get plugged into. It all boils down to the fact that this is an instrument in raising up a new generation for the church." Aside from the powerful preaching and enlightening instructional sessions, much of the soul penetration lies in the music's strength, brought together by singer, songwriter, producer and multi-instrumentalist Henry Seeley. This creative director extraordinaire has been the figurehead behind Planetshakers' four modern worship albums that have sprinted up the Christian charts back home. "The reception we've seen has been amazing, but we're not here to build a movement about ourselves," says Seeley with a humble tone. "It's not about being the next big thing, it's about us empowering young people and connecting with them. We're thrilled to see the numbers, in attendance and sales, but that's because we see them leading to youth groups growing and churches being built." Thanks to such effectiveness overseas, the Truth centered group has hit American radar screens, starting with various Word label representatives, leading to president Barry Landis. The well-respected music industry veteran caught the Planetshakers' buzz upon immediate impact, which he hopes will be recreated in America via a record contract and the forthcoming Open Up The Gates CD. "It's funny because these types of big labels get hundreds upon hundreds of bands that submit to them and most of them just get listened to rather quickly," notes Evans. "For some reason, we stuck out from the pack and we were told that Word had been looking for this type of worship experience for the prior eight months!" As the two entities' courses aligned on the same track, so did brainstorming surrounding the Planetshakers' stateside introduction. Unlike the group's previous recordings, which were recorded live and released following each conference, this album was cut in studio and available as an instant take home resource following this year's gathering. The material is also 100% original and written entirely by group members, not just a rehashing of continuously covered standards. "Open Up The Gates has already made an incredible impact in the congregational setting," explains Seeley. "It also has a place with the individual that gives them an outlet to pour themselves wide open and be desperate before God." Much of the record's ability to connect flows from a topical blend that's taken straight out of Scripture, the songwriters' personal experiences and testimonies received from past attendees. Aside from these grounds of relation, the project's artistic axis rotates between towering crescendos, momentum building choruses and periods of somber sonics that generate spiritual surrender. "There's a blend of so many elements, but in the end each song is a declaration to praise God," explains contributing musician and songwriter Michael Guglielmucci, who also serves as the youth pastor at Planetshakers Church in Melbourne. "There are songs of hope, healing and faith that come out of the joyous and challenging times in people's lives." From the preliminary rhythmic roars of the title track (a preparatory cut that calls all into the presence of God) to the ethereal closer "How I Love You" (a hands up tear jerker) the gang engages, envelopes the senses and entertains. Along the way, moving mid-tempo rocker "You Are Holy," swooning ballad "It's All About Jesus" and the earthy acoustics of "Reason I Live" further draw people to the foot of Christ's throne. Instances of vulnerability and openness are especially evident on tracks like "All I Want Is You" (which speaks of shedding secularism in favor of holiness) and "Rescue Me" (written about the pain derived from daily letdowns). Those emotional outcries are again supplemented with the exuberant heights of "My Passion" and the reassuring rhymes of "Everything To Me." "Nothing on the project messes around, they are really just expressions of my heart," confirms Seeley. "I hope people can have the same type of life changing encounter that we discovered when He worked throughout this project." Though the recording is poised to put Planetshakers in place for a stateside revolution, those closely associated are realistic surrounding the challenges that stem from the process. Thus far in its history, non-believers haven't been the ministry's greatest opposition, it's been those stuck in religious routine. "We've had people weighed down by religion say that we're too extreme in the way we present the Gospel and we're likely to encounter that again sometime down the road," observes worship pastor Sam Evans (also Russell's wife) who lends her glorious vocals and vertically minded songwriting to the record. "We don't try to persuade them by arguing, but to come along for the ride and experience what God is doing- to allow the music and the live experience to touch them, transform them and let God speak for Himself." Aside from those that aren't immediately receptive, the band also must rise above being lumped into contemporary worship contexts, which some critics have deemed as over populated these days. 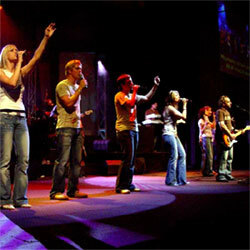 "In people's minds, we may just seem like another band in the praise and worship market," admits Seeley. "But hopefully that preconceived notion will be broken and the momentum we have in Australia will allow the movement to break out here as well." Beyond moments of setback, the challenge of cultivating souls for Christ and the risks associated with crossing over into other countries, Planetshakers' plan is to press on with its Divine Calling. As the title of the record boasts, the group seeks to open the gates of heaven by boldly proclaiming and having people accept the Gospel here on earth. "If you're really going to capture the planet, you really have to shake America and the entire country's hearts," Director Evans concludes. "Australia saw the passion and joined in already. God has given us the same mandate to capture the hearts of American young people and then the tone is set from there- to empower young people one territory at a time to win the world for Christ!"